Current Offers for Hoot Owl Hoot! In Hoot Owl Hoot! the players want to move all the owls back to their nest before the sun rises and the new days begins. To set up the game, place the sun token on the first place of the sun track, place three owls on the starting spaces of the owl track, and gave three cards to each player; the fifty-card deck includes 36 color cards (six each in six colors) and 14 sun cards. Players keep their cards face up in front of them so that they can work together to strategize how to move. If a player has a sun card, on her turn she must discard the sun and move the sun token one space; if she has all color cards, she discards any one color card, then moves any owl to the next open space of that color. If an owl “flies” over an owl on a space of that color on its way to the next open space, all players make a hooting sound! 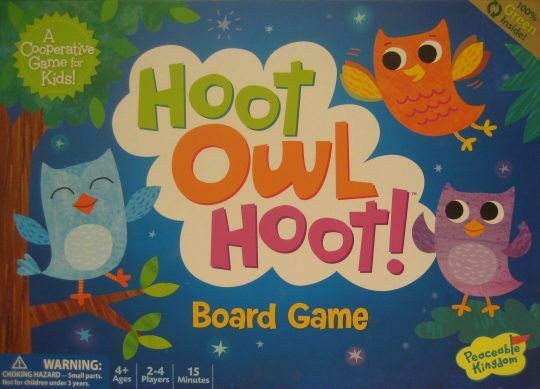 Hoot Owl Hoot!, along with its European counterpart Flieg mit, kleine Eule!, includes six owls, and players can make their game more challenging by adding more owls to the track at the start of the game.